What is a Tai Tai? Tai Tai is a Chinese term for a wealthy married woman who does not work. (Thanks, Wikipedia!) It’s like calling someone a “lady”. It can be a good thing – or derogatory. It can also mean the wife of highest status in a polygamous marriage. Especially when there are concubines. A man just reeds to be able to distinguish between his women, am I right? Ummm…I don’t think there are more of me (wives OR concubines) around. However, there have been times when I asked my husband for a wife of my own! Now I have one! Sort of. She’s not a wife, but an ayi. We have an ayi named Yufen. She calls me “Miss” to my face but “Tai Tai” when referring to me. I like to think that she’s using it respectfully? Who knows. I don’t really care! I’m just happy to have her. An ayi – translated as “auntie” – is a housekeeper, nanny, cook, translator (if you’re lucky). In short, a Renaissance woman. She can do it all. We found Yufen from a US family who was moving to Europe for their next assignment. She came highly recommended and I’m so pleased to have her. She is pleasant, friendly and very, very efficient. She arrives around 8:45, cleans the breakfast dishes, starts the laundry, makes the beds, cleans the bathrooms and vacuums the floors. THEN she makes lunch and we plan dinner. I LOVE her. her English is solid, much better than my Chinese. I’m getting to know her, and really like her. Yufen has fixed issues with the house – leaky pipes, no hot water, then TOO hot water, low water pressure…we’ve had a lot of water problems. She will help me with my Chinese, once I have some to be helped with! She can stay with the children and seems to really like them a lot. 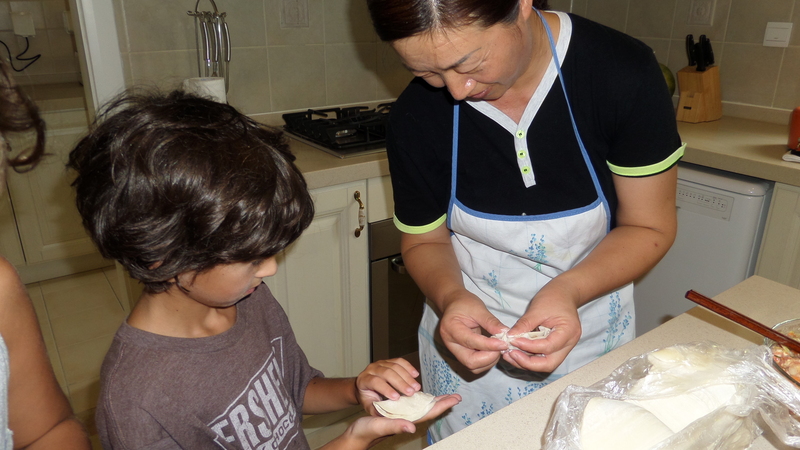 She showed us how to make dumplings the other day, and they were DELICIOUS! I’m thankful to my husband for interviewing the three women I found from departing expat families. I’m hoping that Yufen is as happy with us as we are with her. Tai tai has many meanings, one of which is just Mrs or wife. In other cities, it can be derogatory but in Shanghai, it’s very commonly used to simply refer to the wife. So I wouldn’t be too worried about your ayi using it towards you! Thanks, Kristin for confirming that! I enjoy reading your blog and am flattered you read mine. I can’t wait to get my crew out and about – once this incredible heat wave has passed. It’s unbearable! Thanks. I’ve enjoyed reading your posts! Your blog is the best one I’ve found about life in Shanghai! I’m with Maria…sounds like the Chinese version of Alice from the Brady Bunch! No, not at all. I had heard that mosquitos are a terrible problem here, but have not been bitten once! I has been super dry here, so maybe when it starts raining they will come out? We have tons of bats flying around the neighborhood at night, so I think they eat them all! I’m prepared with all kids of repellants..just in case!